As a child, I spent hours staring at my favorite soccer players on television, completely and utterly mesmerized by their sheer skills. I lay in bed at night surrounded by my posters of Pele, Franz Beckenbauer and Carlos Alberto, wondering what it would take to get from mimicking them in my backyard in their jerseys to scoring the winning goal in a World Cup match. While my daydreams might’ve stopped there, I dug deeper than the awe these players evoked in me. I studied their every moves; I dissected every pass, every improvisation, every steal and every save. Each player had his own set of skills he had worked to perfect. Pele had his speed, agility and goal-scoring sense; Beckenbauer had his composure, creativity and improvisational skills and Carlos Alberto: his physical presence, leadership and confidence. Recognizing my love of medicine at an early age, I went to engineering school first. I didn’t want to just learn medicine, I wanted to learn how the tools of the body worked at a more mechanical level. Here, the concept of reverse engineering struck a chord with me. Taking something apart and putting it back together seemed the best way to understand how an object really worked at its core. Why couldn’t this reverse engineering of machinery apply to learning the ins and outs of the human body? I carried this obsession with dissecting the details into my medical training after engineering school. To really learn the skills you admire—whether it’s athletic ability, surgery techniques, presence when public speaking—you’ve got to take it apart piece by piece and study how to duplicate it. The process is slow, it’s deliberate, it’s strenuous, but it’s necessary to continue to improve your skill level and reach your peak performance. While completing my residency at Columbia, I dissected the skills I admired in those around me—calm under pressure, biomechanics expertise, and patient interaction. Every person you meet will have a unique set of skills they have worked hard to build. Once you recognize their strengths, it’s up to you to hone in on those specific skills and actively observe them in detail. 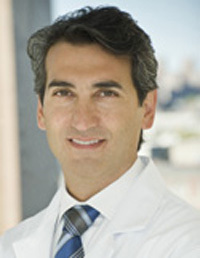 The best surgeons, like the best chefs or chess players, break it down, master it, and reassemble the pieces. Oftentimes, you’ll find a skill is difficult to duplicate. When that happens, slice it into smaller and smaller pieces. Instead of working to perfect the optimum baseball throw, break it down. What makes the perfect throw? It’s in the wind-up; it’s in your stance; it’s in the positioning of your fingers on the ball. Instead of overwhelming yourself with all of these at once, try starting with the perfect wrist flick to release the ball. Do it over and over again. Study that specific motion in professionals you admire. Videotape yourself doing it and study how you could have done it better. Once you’ve perfected that, move on to your grip. You can apply this technique to learning almost anything in life. You can’t cook the perfect pasta dish if you don’t perfect the flavors in the sauce, the firmness of the pasta and the plating technique individually. By breaking down what makes something great, learning the individual techniques and adding those skills into your repertoire, you can push yourself to be your best—no matter what it is you’re trying to achieve. Rick Porcello wasn’t expecting the reaction…at least not in an area populated by rabid New York Yankees fans. Chosen out of high school at New Jersey’s Seton Hall Prep in the first round of the 2007 first-year player draft by the Detroit Tigers, he had received the expected congratulations from friends and acquaintances. But it was nothing like what happened when he was traded to the Boston Red Sox prior to the 2015 season. “People came out of the wood work…I had no idea how many Red Sox fans there are in New Jersey,” he marveled. A 14-game winner in his 2009 MLB rookie season with Detroit, Porcello recorded double-digit wins each year through the 2014 season, and shortly after the trade to Boston he signed a 4-year contract extension worth $82.5 million. Porcello went 4-2 in his first eight starts in 2015 before dropping seven straight decisions. He was placed on the disabled list in early August for the first time in his career with what was said to be triceps soreness and inflammation. 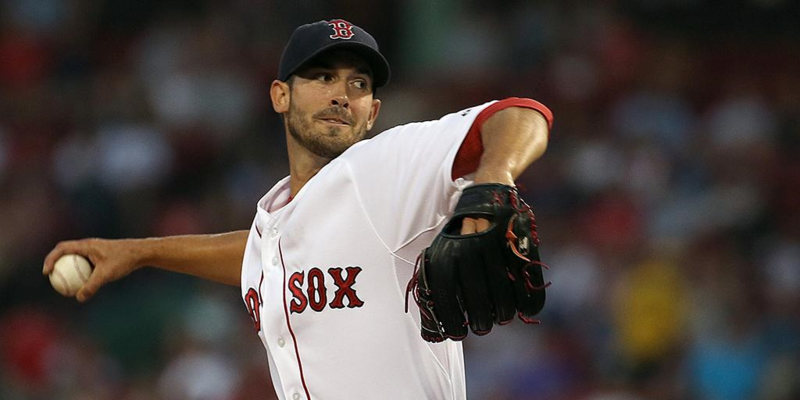 He returned in late August and threw a 7-inning gem against the White Sox at Fenway in a 3-0 Red Sox win. He ended the season 9-15, just the second losing season in his 7-year MLB career. 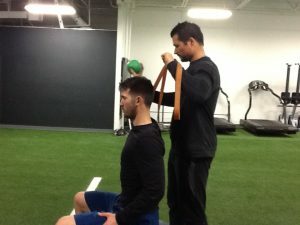 Shortly before leaving for spring training this past January, Jim Monaghan from the Baseball Health Network had a chance to talk with Porcello following one of his off-season workouts at the Annex Sports Performance Center in Chatham, NJ, not far from his off-season home. Along with Mickey Brueckner, a former college ballplayer and owner of the Annex, Rick discussed how he’s managed to remain relatively injury-free during his career, the importance of listening to your body, sport-specialization, and more. BASEBALL HEALTH NETWORK – Up until this last year you really had no arm issues to speak of…nothing that really shut you down. How have you managed to stay as healthy as you have through your career so far? 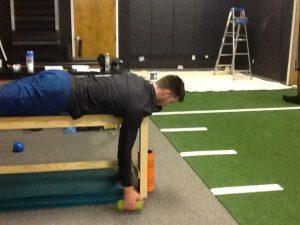 RICK PORCELLO – I think, and I’m not just saying it because he’s sitting right here, but it does start here (the Annex) with the injury prevention and arm care stuff that I’ve learned throughout the years. It started with Mickey (Brueckner) and then the training staffs that I worked with in Detroit and now in Boston. It’s all that knowledge collected together and plus paying attention to the detail that’s provided and taking care of your shoulder religiously…as far as I’m concerned that’s really the only way to do it. And you have to be smart as well. I mean, you have to do what you have to do to get ready for spring training especially if you’re competing for a job. There’s a fine line between throwing the right amount and throwing too much. You only have so many bullets in your arm so just managing our throwing programs and paying attention to arm care and the exercises that we do to prevent injury and just staying in shape. BHN – You made the jump from high school ball at Seton Hall Prep directly to pro ball. Going from the shorter game schedule in high school to more games/innings in pro ball…how much of a jump was that for you? RP – It was a big jump. I went from throwing 50-60-70 innings and a little bit on a summer team and fall ball…and you only have so much time between starts when you’re in high school and you’re playing on summer teams you have a lot of time to recover…you don’t feel any of the soreness that I felt when I moved to A ball and I threw 125 innings that year. I got skipped over a couple of times that first year but basically from start to finish I felt it. At several times over the course of the year I could feel myself getting tired. A lot of people think when you start to get tired you need to shut it down and rest. I think you learn something about yourself and you figure out how to pitch when you are tired. That first year kind of battling through some of the fatigue that I experienced I was able to learn how to use my legs a little bit more, get through some of those situations because you’re not always going to feel 100% especially over the course of a 162-game season in the big leagues. So that jump was big and I think that first year in A ball I needed that work to then be able to throw 170 innings the following year. BHN – Mickey, when you were working with Rick coming out of high school and he was going into that first pro ball season did you change what you were doing with him to ramp him up for that next level? MICKY BRUECKNER – Obviously physically he was gifted to do the things he was able to do. At that point it was more a shift in a lot of injury prevention and things like that. Obviously the work you do in the off-season creates that longevity throughout the season. That’s a really important time for these guys to get in as much strength and conditioning as they can in the off-season because once the season starts it’s really just a race to the end of the season and you’ve just really got to maintain at that point. His first true off-season in the winter we just worked on getting him stronger, on breaking through any dysfunction or asymmetries and things like that. Really every year at the end of the year you build up a lot of asymmetries and issues biomechanically toward the end of the year so the first couple of weeks to a month we get an athlete back from the season it’s really just taking care of all that dysfunction and asymmetry and working through that. Once you’ve corrected a lot of those issues then you can really start to build him up. I think that was really the biggest thing when he came back from his first year…just getting him stronger and just building that work capacity up. BHN – Two years out of high school you make the really big jump to the major leagues. What was that like for you? More games, obviously…and clearly more pressure. RP – Well I was fortunate enough…Jim Leyland was my manager and he obviously recognized all that and took care of me especially early on in the season. They’d skip starts for me and I think that by April 25th I’d only made two starts. They had a formula for me going on through the season to make sure that I wasn’t overthrowing or exceeding my innings limit. I think I hit a little bit of a wall before the All-Star break. I had a couple of starts there where I started to feel fatigue. Really, once I hit the All-Star break and I had those three or four days off I felt great the entire second half. I was able to pitch in Game 163 and feel as strong as I’d felt the whole year. I think that’s a tribute to the work we did in the off-season. All of this is for August and September and obviously hopefully October and November. That’s why you come in here every day and bust your tail because you want to finish strong and that’s really when it’s crunch time and most important. BHN – During the course of your off-season training with Rick, how much do you do with weights versus other forms of conditioning? MB – When he’s about ready to go down to spring training, we’re starting to taper him down because the more throwing he’s got to do the less training we can do so it’s all inversely proportionate. When he’s not throwing during the months of October, November and December, that’s kind of our go time. January, you have to be a bit more strategic with your heavy days and things like that. As far as lower body goes, we push him as hard as any other athlete. He’ll squat, he’ll deadlift, he’ll move a lot of weight with that. 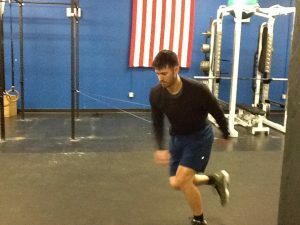 Upper body, as an overhead pitcher, typically you’re not going to push him all that much, more or less just building good functional movement patterns and strength through those patterns. Really, he’s also in an active recovery week this week, knowing that this is the week he’s traveling (to Spring Training) so his volume is much less this week considering that. Last week he finished up on his toughest, heaviest week of the off-season. 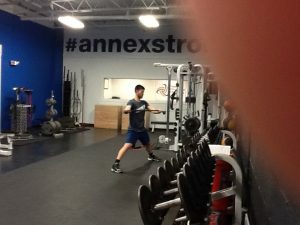 I think a lot of the misconception with baseball is so much focus on flexibility mobility – and that’s all important – but you don’t have to baby these guys in the weight room. You can push them hard. If you correct those dysfunctions early in the off-season you can push them much harder this time of year. If you don’t, if you have those issues and you just kind of gloss over them and don’t correct them at the beginning of the off-season, they’ll rear their heads toward the end of the off-season. So it’s really important you address those things first before you get into anything of substance and I think this year he’s been able to do that because we had the extra time. I wouldn’t take this as a normal day; because he’s traveling today I didn’t want to overdo it. BHN – Rick, did you play others sports as a kid? RP – Yeah, I played basketball, football…and when I wasn’t playing in an organized league or team my brothers and buddies and I were playing wiffle ball, touch football, pretty much anything. I was always active and really loved all sports. BHN – One of the things we’re seeing a lot at the Baseball Health Network is sport specialization, and it’s happening at an earlier age. I have a battle with my own son who’s 14. He loves baseball…it’s what he wants to do…it’s ALL he wants to do. I basically had to tell him at one point, “You HAVE to stop throwing…take two weeks off.” Otherwise he would literally throw year-round. And obviously it’s the kind of throwing that you do as opposed to the volume of throwing, but what are your thoughts on year-round training, Mickey? MB – You look at the benefits of playing multiple sports and realize that you build athletic movement because you’re exposed to a multitude of different movement patterns. Exposing kids to different sports at a young age, that’s when they learn how to move, that’s when athleticism is built. Once you have these athletes who start specializing as they get older in high school, training is so important because basically you’re taking a kid who’s not exposing himself to multiple movement patterns and getting an athlete who is stuck in the same sport doing the same thing all year-round. That’s kind of now the norm so to expect to change that whole dynamic is relatively unrealistic at this point. So my job is to say, “OK, I can’t change the system but I can basically work around it.” Here’s this athlete’s dysfunction – because they play the same sport all year-round – now baseball’s an even more high-volume sport compared to any other sport you’re looking at so I really have to make sure when I see these kids I need to assess them, figure out where their true dysfunction is and I need to address it right away. If they don’t, I can get them going on a reasonable strength and conditioning program but if there’s dysfunction at the onset of training, we can’t skip over that. So the benefits of multiple sports is you’re not getting that pattern overload, that stress that you see an athlete getting if they play the same sport over and over again. I think the benefits of what we’re doing is you’re now applying what most other kids who are playing multiple sports…that’s what they would get doing that. BHN – Rick, when did you start to specialize in baseball? RP – After my sophomore year in high school. I stopped playing football after middle school because I had gotten a concussion and I was kind of growing. When I was 10, 11, 12 years old I was a running back and linebacker and I sprouted up and I kind of grew out of those positions. I was better at baseball and basketball; that’s the route I went. And then I stopped playing basketball because I realized that I had a future in baseball and I couldn’t devote as much time to basketball as I had to devote to baseball. I couldn’t play basketball in the summer because I was playing baseball and I just wasn’t going to be able to be as competitive as I wanted to be playing basketball and I felt like my future was in baseball. That was the direction that I wanted to head so I started specializing in baseball. But even then I played spring, summer and fall but took time off to enjoy other things. Not feel pressure to having to play every day and really just enjoy my time through high school. Obviously work hard and do those kind of things but I think there’s so much emphasis on feeling like you HAVE to play every day, you HAVE to do this, and you HAVE to do that to compete. You do that…and that’s great…you’re working hard but sometimes you can lose the enjoyment in it. I had such a strong passion for baseball, and I still do, and I think it’s because I didn’t burn myself out on it. That’s really important because you see a lot of kids now who are playing all year-round and I think some kids even drop out of playing baseball because they get burned out on it. BHN – And you played in a VERY competitive high school program at SHP. RP – Yeah, baseball and basketball were extremely competitive there. And that’s kind of why I opted to not play basketball and just play baseball. I wasn’t going to be productive for the basketball team and I couldn’t devote time to both and still enjoy whatever teenage kids do. Our baseball program is one of the best in the state so it was a challenge and it was a lot of hard work but extremely enjoyable. BHN – Mickey, you had two Tommy John surgeries. The second one basically ended your playing career? BHN – How long was the rehab from the first operation, about a year? MB – They say it’s a very vague 12-18 months rehab. I was on the longer end. The second surgery was about a year after my first. When I had my surgery it was at the end of the baseball season so no matter how quickly or slowly I got through that 12-18 months, it would still put me at the end of the season so for me it was one of those things where I said what’s the point of rushing? If I had finished in 12 months it would still be at the end of the season so it didn’t make a difference. BHN – Kind of like the Matt Harvey situation? MB – Yes, but then after the second surgery I’d been out of the game for three years and when I came back I was nowhere near what I used to be. 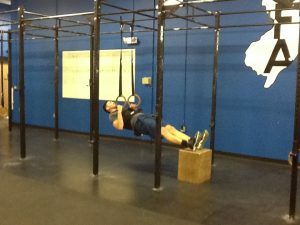 My shoulder health wouldn’t hold up and at that point I figured out this (training/conditioning) was what I wanted to do. It was a tough decision to walk away from the game but it was the right decision for me and I’m glad I did it. BHN – So you can speak to the frustration of that kid who has TJ surgery and goes from being able to compete at a high level in college baseball to throwing at a distance of about 40 feet just lobbing the ball. MB – It’s a bit humbling for sure. I think the guys who do well through that process are those who understand the importance of a process and doing things properly. Rick talked about the importance of having a system and that’s kind of the way I approach my training here. Everything’s done with a purpose. I think some guys, the whole PT and rehab process is a lot easier than others. I think it’s also based upon who you’re around. I was fortunate enough to be around good people. At that time I removed myself from college baseball and I was just a student so it was a different perspective from what a lot of guys do and maybe at the professional level or the collegiate level. It’s for sure humbling but it’s one of those things that if you’re passionate enough and you want to make a career out of baseball then you do it until proven otherwise. BHN – Rick, you’re obviously at the highest level of the game and for lack of a better way of putting it there is an epidemic of injuries throughout every level of baseball from the youth level to the major leagues. As you watch one player after another go down with a serious arm injury how does that affect your mindset? RP – First of all, you appreciate when you are healthy and for me it makes me continue to want to do the little things that I’ve been doing over the past couple of years to stay healthy. Obviously anything can happen. We all know the risks that you take playing – on any given pitch or any given swing you could hurt yourself and potentially not play again so it makes you want to continue to work hard. If I take a day off and then I go out there and get hurt I might not be able to sleep at night knowing that I did do everything I possibly could have to prevent that. I just try to cover all my bases and leave no stone unturned when it comes to maintaining my shoulder health and fitness and just take it seriously. I can’t really explain why there are so many injuries now. It seems like when you look at a major league bullpen now there’s not one guy throwing below 95. They’re all throwing 95 and up and that’s a lot of stress on your arm. Maybe that has something to do with it. It is kind of crazy how many guys are getting hurt now. I think it’s hard to put a finger on it really. You just do what you can to stay healthy. BHN – When we were talking before and I asked you how much down time there was for you after the season ended you said you only take about two weeks off. RP – Anything more than two weeks and I feel like I start to lose strength I built up the prior off-season and maintained throughout the course of the season. So two weeks off is really enough for me to rest my body and feel rejuvenated and physically be able to get back into the weight room. Our first week isn’t like we’re going all out lifting. We take a week or two to ease back into it and as Mickey said correct some of the imperfections that you develop over the course of the season. Not to mention that two weeks of doing nothing…it would just drive me crazy…so I’ve got to get in here and do something. BHN – Mickey, when you typically start with a pro athlete getting him ready for the next season, what’s the process that you go through? MB – The first thing, based on what I’ve done with Rick, is we sit down and go over how the season went, what went well, what didn’t go well, how did you feel, are there things that you did throughout the year that helped out with any discomforts or issues, or things that didn’t work at all? If it’s somebody new, I’ll ask what type of training they’ve done before, what’s their injury history? And from there I go through a biomechanical assessment, I’ll look at a lot of range-of-motion, lower body flexibility and mobility, making sure that the athlete has enough mobility within their joints. I look at some postural stuff to see if there are any asymmetries…a lot of those things that for me would raise any red flags for potential injuries down the road. And then I do a functional movement screen, just addressing basic functional movement patterns – squatting, lunging, rotary stability, pushing. Really, that’s kind of the first step. From there I’ll take all that information and put together a comprehensive program specifically for that athlete. Typically, if there’s a list of dysfunctional movement patterns, I’ll address those first within the first two weeks to a month. If they get through those things I’ll reassess them every week to see if they’re improving. If they’re not, then I have to re-do my programming. If they are, then I’ll progress them along. Typically I use what’s called a general physical preparedness phase anywhere from two weeks to four weeks depending upon the athlete and their response to it. And then from there we’ll start their first real phase of strength and conditioning and building upper and lower body strength and core stability. Arm care, I typically get started right away. As they approach their season and they start throwing more I have to start taking a little bit away from that because you don’t want to overtax their cuff muscles and their stability because when they throw they need that. BHN – When does the throwing actually start you for in the off-season, Rick? RP – Generally the middle of December. Sometimes it depends on how deep we go into the playoffs but usually I like to start playing catch in the middle of December. That allows me to get my arm strong enough and prepared to throwing and long-tossing in January and getting my bullpens and flat ground work in and start to get into my delivery. My first year, I waited until probably January 15th and that was way too long. It took me longer to get my arm going because I’d had so much time off throwing that I felt like I was a little bit behind in spring training. So I like playing catch in December. It’s very low-stress, low-impact throwing. It’s just kind of getting the blood flowing and waking all those muscles up. January is when we start to ramp it up. BHN – When do you actually get on the mound as opposed to flat ground? RP – It depends. I have to listen to my arm and my body. Maybe the second week of January I’ll get on the mound. I like to have a handful of bullpens in before pitchers and catchers report. From year to year it changes a little bit because there might be something that I’m feeling that year that I didn’t feel the year prior and vice versa. If I feel good I can do a little bit more. If I feel like I’ve got to take it a little bit slower then I’ll take it a little bit slower. BHN – What’s in-season maintenance like for you? RP – It’s an everyday thing. A starting pitcher pitches once every five days so in between you have those fours to recover, maintain, and there’s actually been years where I felt I built strength with those four days in between. My first day after my start is a long run and lower body lift. I’ll play catch that day. Day Two is more longer interval running, a bullpen session, upper body and shoulder maintenance. Day Three is like a core, 30-minute continuous cardio workout with core and lighter lower body stuff in. I’ll long toss that day. Day Four is a little flat ground with stretches and get ready to pitch on Day Five. BHN – After you came back from the disabled list last year, I went to a game at Fenway with my son and we were in the bleachers behind the home bullpen and it was one of the first times I actually really paid attention to a major league pre-game throwing session before. I watched your stretching and long toss and was amazed at how much work you did before throwing a single pitch in the bullpen. I watched you and Blake (Swihart) and I think you were mostly working on a two-seamer that day. And I thought, “And NOW he’s going to throw 100-110 pitches in a game.” I was floored at the amount of work that went into it on the day of a game…never mind what you do in between starts. RP – Yeah…it’s all a process. And that preparation has kind of evolved over time. My rookie year when I was 20 years old I would basically just pick up the ball and get on the mound and just start firing. But now as you start to log more innings it takes a little bit longer to get loose. You also start to understand the attention to detail that you have to have in preparing to go into a game. There are a lot of repetitions that go into it. Baseball…that’s what it’s all about. It’s a sport of repetition and to do that repetition properly it takes time. 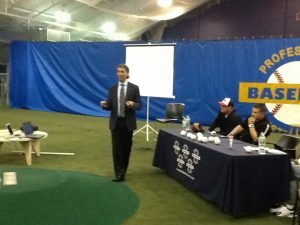 The Baseball Health Network‘s latest seminar – “Coach, my arm arm hurts.” Now what? 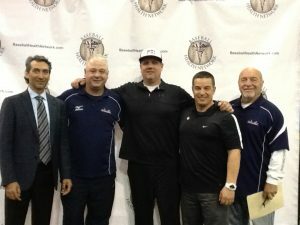 – was held at Professional Baseball Instruction‘s indoor training facility in Upper Saddle River, New Jersey. The evening was hosted by BHN founding partner Doug Cinnella and featured presentations by BHN founder Steve Hayward, Performance Director Eric D’Agati, Dr. Christopher Ahmad, and legendary former MLB pitching coach Leo Mazzone. Highlights included a full demonstration by Eric on Trunk Rotation and Shoulder Mobility, using a local high school coach as his test subject. A full video showing how to test and fix trunk rotation can be found under “premium videos” here on the BHN website. 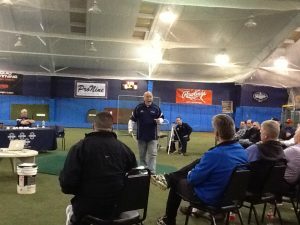 Steve detailed the importance of proper throwing mechanics, along with ideas on playing catch with a purpose. 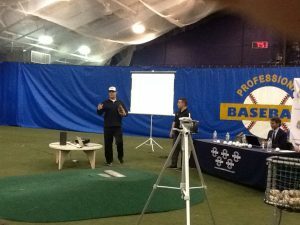 He also incorporated a power point presentation that illustrated some of the common mistakes young pitchers make and how to correct them. Dr. Ahmad‘s power point demonstration shed light on baseball’s current love affair with velocity, and how it’s not necessarily good for the game. He also showed video footage of an actual Tommy John surgical procedure. Leo Mazzone spoke of the benefits of throwing more often with less intensity and how that philosophy not only carried the Atlanta Braves to 14 consecutive National League Eastern Division crowns an a World Series victory, but also helped keep his pitching staffs relatively injury-free under his supervision. A full Q&A, hosted by PBI’s Jim Monaghan, followed featuring questions from the audience as well as some submitted in advance over the Internet. “Coach, My Arm Hurts.” – Now What? If you or your child has played baseball for any appreciable amount of time, there’s a good chance you’ve heard complaints of pain. 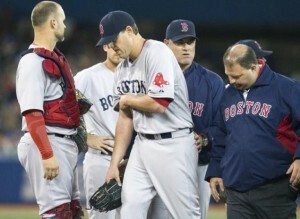 It has become all too common for players to be suffering from pain in their throwing arm. Many times it’s just a warning sign from their body that something is wrong and if addressed properly, there will be no further issues. Other times, that warning sign is just the beginning of something far more serious – possibly an injury that can lead them straight into the operating room!!! The statistics are there – each year, players younger and younger are experiencing serious throwing arm injuries. Some of these injuries are causing players to miss a couple weeks of practice and games; others are ending their seasons, even threatening their careers. 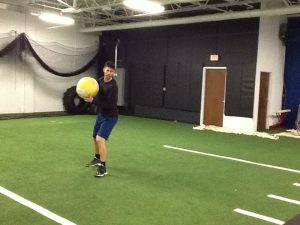 The bottom line is this – throwing a baseball puts extreme stress on the joints, tendons and ligaments of pitchers as well as athletes who play multiple positions. The only way to prevent your child from becoming a statistic is to educate yourself on both the causes and solutions. 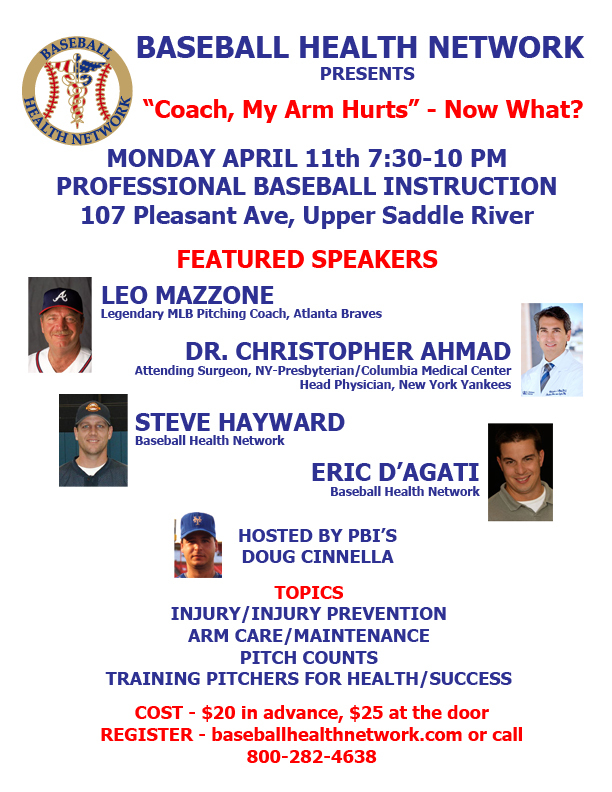 On Monday April 11 from 7:30-10PM, the Baseball Health Network will present an educational seminar on this topic with an All-Star lineup that includes legendary MLB pitching coach Leo Mazzone, Dr. Christopher Ahmad (head team physician for the New York Yankees), and Steve Hayward & Eric D’Agati from the Baseball Health Network. Professional Baseball Instruction’s Doug Cinnella will be your host for the evening.